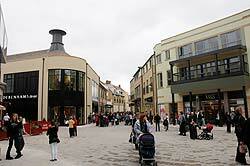 Witney has been lucky enough to attract some major retailers over the years with many major chain stores opening. Witney has a unique blend of shops, from large stores including Waitrose supermarket, Currys.digital, WH Smith and Waterstones, to many smaller shops such as Rapture and The Little Emporium. Marriotts Walk shopping centre has brought more big names to the town, including Debenhams and Marks & Spencer and Jo Jo Maman Bebe while the Woolgate shopping centre has attracted fashion giants Next and H&M to join its 24 other top retailers. On the High Street Jigsaw and Jack Wills are recent arrivals. Long-standing shops include the catalogue retailer Argos, the home and garden store Robert Dyas and the clothing retailer Fat Face. The chain Holland & Barrett also have a shop in Witney. You can find their store in the Woolgate centre. But it's not all big chain names in Witney, dotted around the town you will find a host of smaller independents offering a unique shopping experience. The Marriotts Walk development opened on 29th October 2009. With stores like Marks & Spencer, Debenhams and New Look it has become an important addition to Witney's shopping facilities. The Woolgate Shopping Centre, with its 800 space car park, is home to stores such as Next, H&M, Currys PC World, GAME, WH Smith, EE and Waitrose. 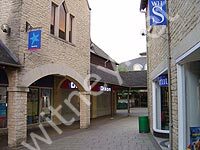 Witney has a variety of shops, both national chain stores such as Currys PC World and Boots as well as local independently owned establishments. And with chains such as Argos, Robert Dyas and Fat Face in Witney, there really is something to interest every shopper! The Marriotts Walk development has brought a new retail area to Witney, and with it a number of big names like M&S and Debenhams. While travelling along Witney High Street you will find a number of banks (Barclays, HSBC and Lloyds included), public houses such as The Cross Keys and the Eagle Vaults, Ask and Clarks. Many other shops and financial institutions can also be found in High Street. The Witney Tourist Centre is now in Welch Way. At the top of the High Street, opposite The Butter Cross, you will find the entrance to Corn Street, one of the longest streets in the town. Part residential, part commercial, Corn Street has many independent shops, fast food outlets and public houses such as The Chequers. At the bottom of High Street you will find Curry Paradise, Shapla, the excellent T4 Cameras and The Wesley Walk and Waterloo Walk shopping arcades. On the third Wednesday of the month in the Market Place you can find the Witney Farmers' Market which is organised by the Thames Valley Farmers' Market Co-Operative. The Witney Farmers' Market moved to its new location from the Church Green in April 2007. Witney has two major car parks, one off Woodford Way and the other located by Waitrose at the Woolgate. Both are free of charge but there are some time restrictions in areas. There is also roadside parking on Church Green. The Welch Way car park closed in January 2008 so that work on the new Marriots Close development could take place. The recycling centre which was located at Welch Way car park moved to the Woodford Way car park in January 2008. Click here for a news story about the relocation of the household recycling centre to Woodford Way. If you're not all shopped out in Witney, then Oxford is just a few miles up the road, as is the charming town of Woodstock.